The American Association of Orthodontists recommends that most children have their first orthodontic appointment around the time they are 7 years old. As not all permanent teeth may have grown in by then, treatment is not started until children are between 9 and 16 years of age. However, jaw growth and tooth eruption problems can be more easily identified as early as that first appointment and can be more appropriately treated. Braces for children are very different from the ones that were available to older generations. Today, there are clear braces for kids that are designed to be minimally visible. 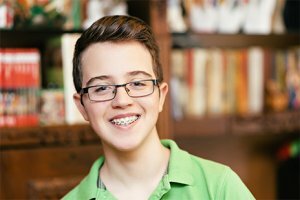 These devices can spare kids the embarrassment so often associated with traditional braces. No matter what kind of dental issue is affecting your child, our trained pediatric orthodontists will figure out the best course of action. We understand that for kids, orthodontics can be uncomfortable and even a little scary. Our team will give your child the gentle attention they deserve.